ChargePoint’s units can be upgraded as higher battery capacities come to market. ChargePoint’s Express Plus units are modular, designed so that they can be upgraded to add higher outputs by adding “Power Cubes” into groups of points. Their cables are also liquid-cooled, and capable of providing up to 400kW – typical rapid chargers today offer up to 50kW – which means they can be upgraded to provide fast charging for the next generation of higher-capacity batteries. 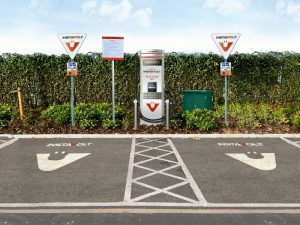 Tim Payne, CEO at InstaVolt, said: “ChargePoint will fulfil two important criteria for us: the charging units are future-proofed so the units can be configured to meet the precise requirements of any site and can be scaled incrementally as demand for higher rate charging increases. This is particularly important as EV manufacturers begin to bring out new models with increased battery capacity.